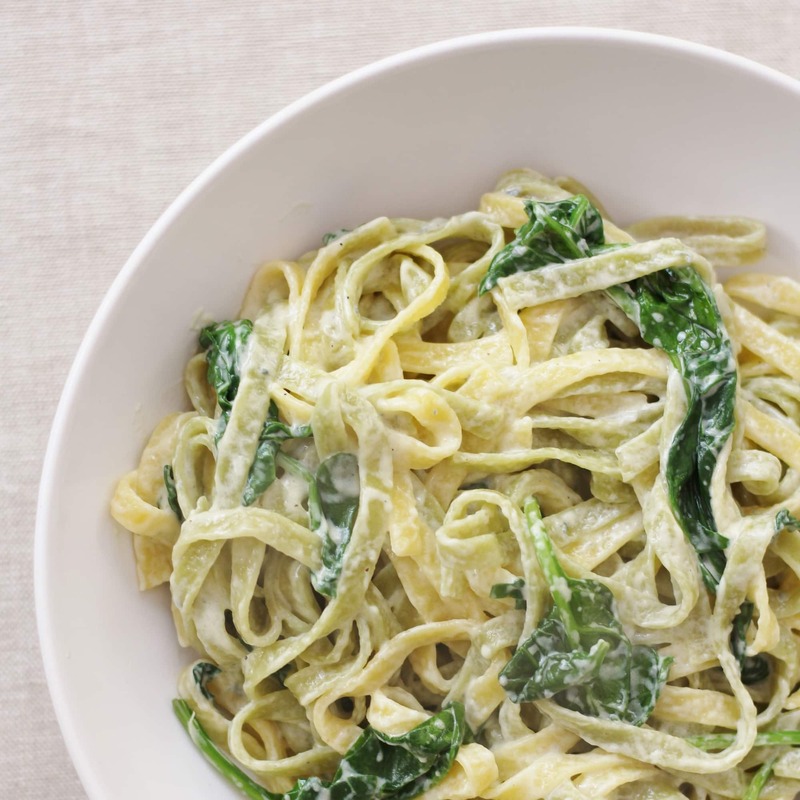 Delicious tagliatelle pasta coated in a creamy blue cheese and spinach sauce and ready in the time it takes to cook pasta – perfect for busy midweek evenings! But I do really love my Italian surname and I was even more excited to discover that Gargano is actually a region of Italy (it’s the little sticky out bit just above the heel) – it looks beautiful and I really, really want to visit one day. So anyway, we were out one day in a nearby town in Sussex, where they just happened to have an Italian market. Well, like most foodies I always make a beeline for markets, I just love them! This one was fab, full of delicious Italian breads, cheeses, olives and other antipasti…I could have stayed there all day and spent a fortune! 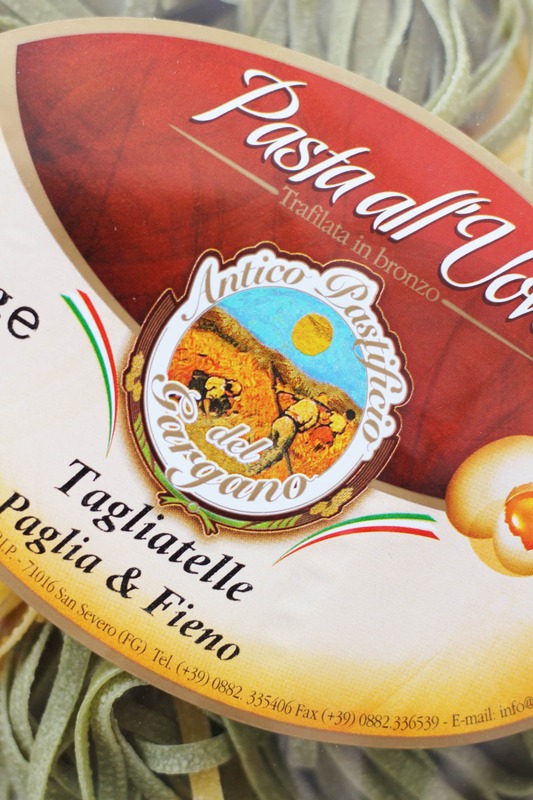 Browsing around we discovered Gargano pasta – this was beyond exciting and I just had to buy some! Well, this was a few weeks ago and like many of my foodie purchases it languished in the cupboard for quite a while waiting for me to dream up something delicious with it…then we went away on holiday and I cooked a lot of pasta on holiday, as it’s so quick and simple, and so I was reminded of a great easy peasy pasta recipe I haven’t done for ages. It’s one of those wonderful recipes which is done in the time it takes to cook pasta – great for super busy days! Pasta with Spinach and Blue Cheese Sauce used to be quite a favourite, but I haven’t made it in AGES! But now I have rediscovered it I will definitely be making it again…and soon! 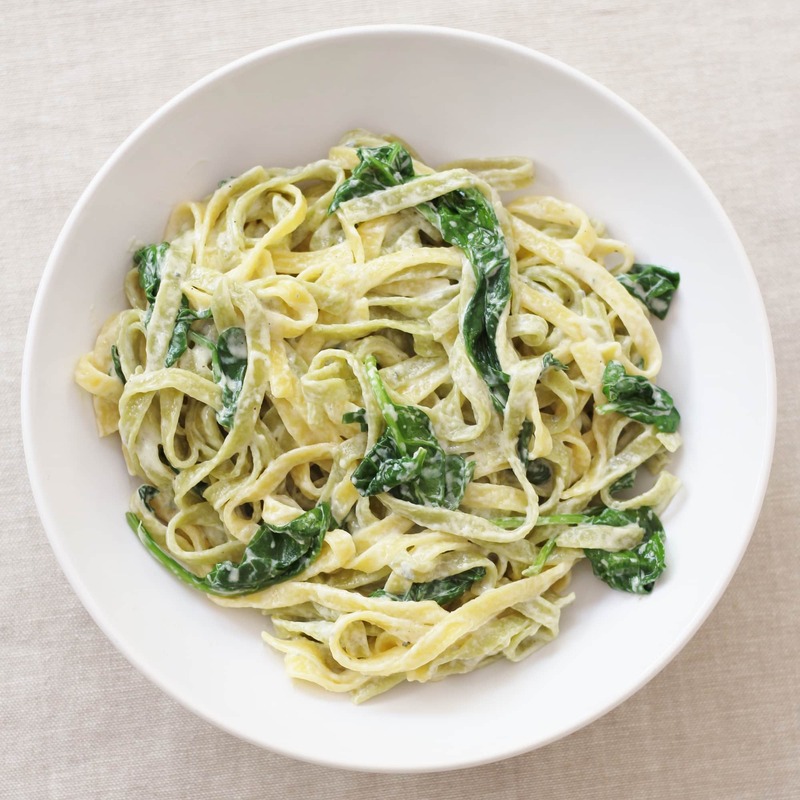 The sauce is so simple garlic, crème fraiche (or you could use cream), blue cheese and spinach, plus a good grinding of black pepper and a splash of pasta cooking water…if you’re feeling decadent you could even throw on a few walnuts, but it’s not essential. I’ve kept the blue cheese flavour quite light here as I was making this pasta dish for my children too, who are not the biggest blue cheese fans in the world – I used a little 70g mini portion of Tesco Stilton, but if you are a blue cheese fan then by all means increase the quantity. If I was making this just for me and Mr G I would have put in about twice that amount! And pretty much any blue cheese will work, I’ve used Stilton in this version, but in the past I’ve tried Roquefort and Gorgonzola too – Gorgonzola is particularly good as it is so creamy and of course fits well with the Italian theme! If blue cheese is not your thing, you could easily swap it for another kind of cheese you like – goat’s cheese works well too, or Boursin or just leave it out altogether. And if you’re not a fan of spinach, you could swap it for roasted butternut squash which is just fabulous…leeks also work very well, but sweat them in butter first before adding in the crème fraiche and cheese. This dish really does need a white wine…blue cheese and red wine just doesn’t work for me (unless that red wine happens to be sweet – like port!). A crisp Italian white such as Soave, Gavi or Verdicchio would work well here, or else a light, crisp Chardonnay or even a Pinot Grigio would all be fab choices. 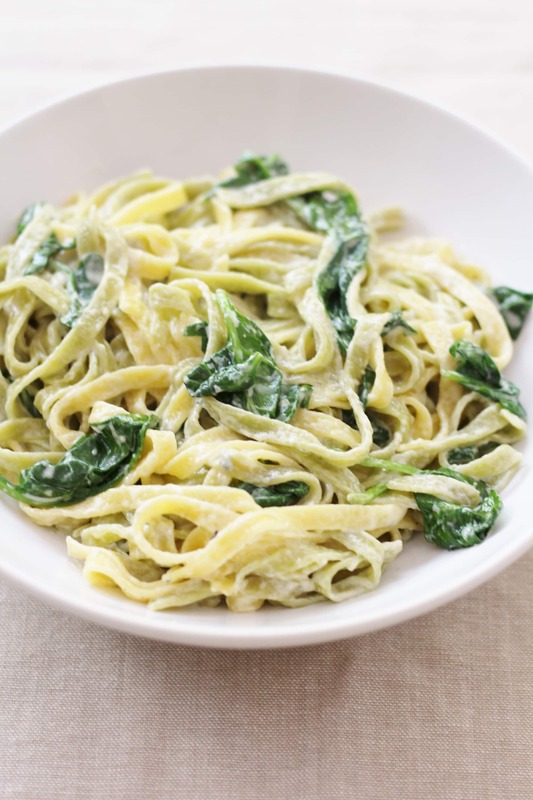 Delicious tagliatelle pasta coated in a creamy blue cheese and spinach sauce and ready in the time it takes to cook pasta - perfect for busy midweek evenings! 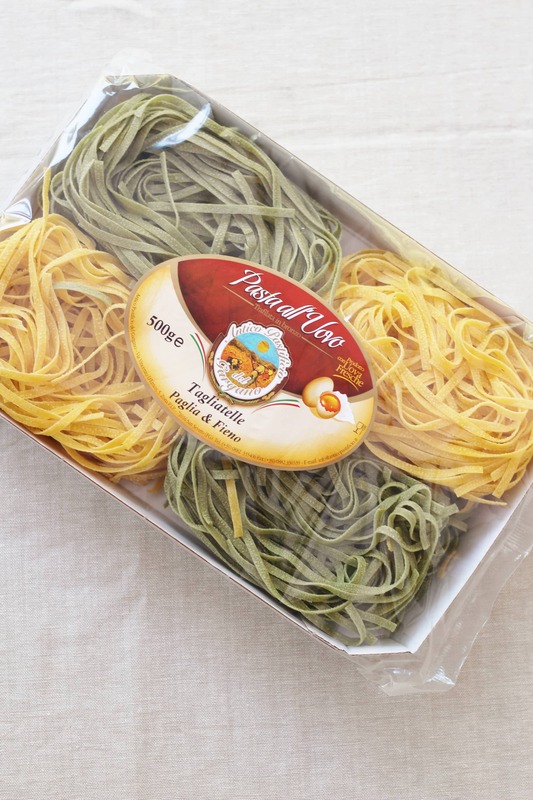 Cook the pasta for 10 minutes according to packet instructions/your own preferences. Drain retaining a little of the cooking water. Meanwhile put the olive oil and garlic in a medium sized pan and cook very gently for about 2 minutes until the garlic is softened but not brown. Do not allow the garlic to burn! Add the crème fraiche to the garlic pan and bring to a gentle bubble. Add the crumbled blue cheese and plenty of black pepper and stir to combine. 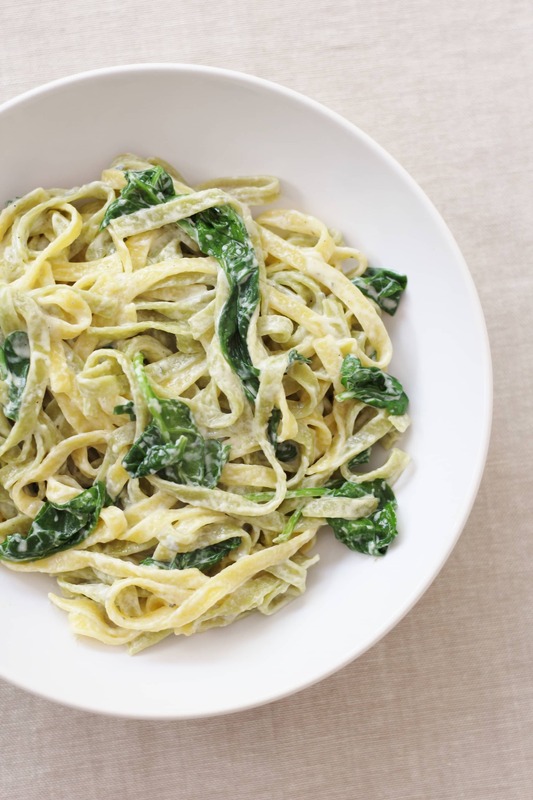 When the blue cheese has melted add the spinach and drained pasta and stir everything together until the spinach has just wilted. Add a little of the pasta water to loosen the sauce and make it extra creamy. Serve just as it is or with a scattering of chopped walnuts and a glass of crisp white wine! Hahaha, how exciting to come across pasta carrying your family name – I think I would have been beyond excited to have come across it. I love what you’ve made with it too, it looks absolutely gorgeous, but I have to admit that I’m never too sure about blue cheese – I thoroughly enjoy it in a spinach & blue cheese open tart which a local vegi cafe makes (though it’s probably more spinach than blue cheese) but I really can’t stand it when it’s on a cheese board, (I know, fussy!). I’ve not heard of the Gargano region before, you should definitely visit sometime (and then write about it so the rest of us know whether we should go too!). I love the sound of this sauce, blue cheese makes such a lovely pasta sauce doesn’t it. I’m so envious of all of your wine knowledge, I wish I knew a lot more. Where did you learn? 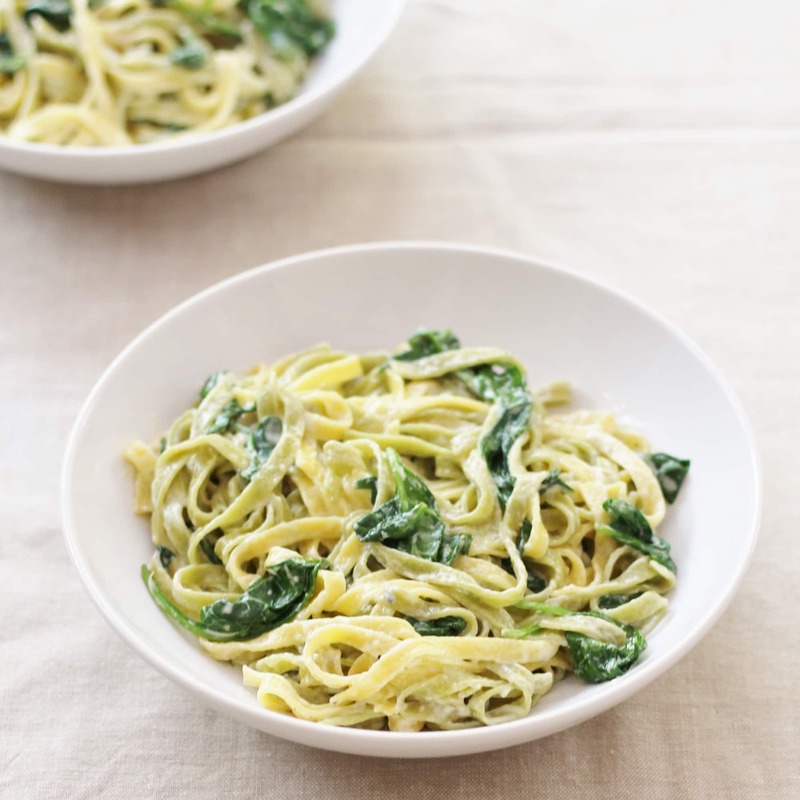 I love cheese and spinach sauce on pasta although I usually make it with a roux so this version would be much easier. I definitely have to try it. Thanks for entering it into Meat Free Mondays. I featured your recipe and stumbled, pinned, yummed & tweeted. Easy peasy for sure and really delicious too! 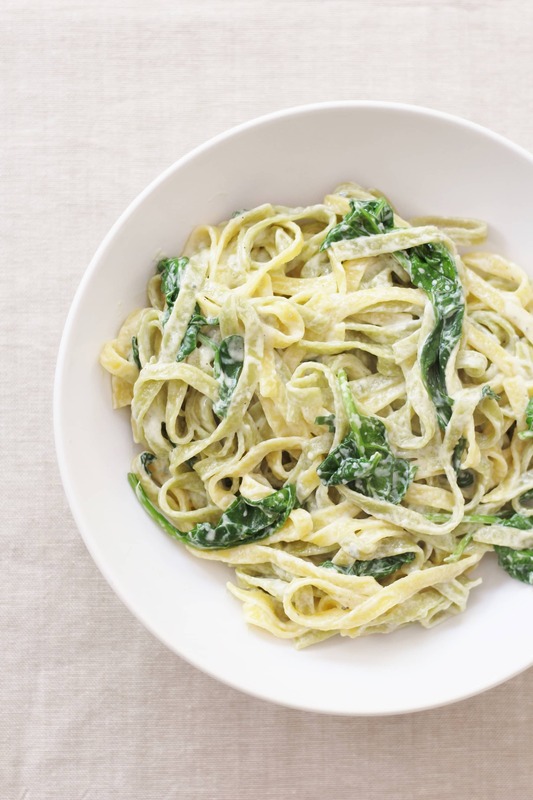 I love spinach and adore blue cheese (the stronger the better) so this is right up my street….